So, now that I have told you that you can do without in my last post, I am going to tell you to shop…no, just to shop smart when you are ready to buy! I love a good deal and quality. The following stores have treated me well so far, or they are stores that have been recommended to me by family and close friends. 1. Home Goods: If you don’t have this store nearby, I’m sorry. If you do have this store nearby and have not wandered the aisles, you should! They do a great job of categorizing the merchandise and even creating vignettes to jog your imagination. I suggest having a plan in mind before you go so that you don’t leave the store with unnecessary items or more items than you really wanted to get! 2. Burlington Coat Factory: I know you are probably thinking that is weird, but they have a pretty good selection of decor and the prices are right. There is not very much furniture, but all of the other decor items you may be looking for are there. Nicole Miller brand is featured here too. 3. Gordman’s: I have yet to visit this store, but I have heard good things. Their website is user- friendly and I am planning a trip this week. 4. Target: Target is great at keeping up with the decor trends. They now have names like Nate Berkus and Emily Henderson designing collections for sale. I enjoy their modern decor and they have some great selections for kids rooms. 5. Amazon: Recently I have read about looking up “as is” items and finding great deals that way. Even without that, there are great deals on furniture and home decor. Make sure you check the reviews and measure carefully since you won’t see the items before you order. 6. Overstock.com: Again, look for “as is” items and shop sales. I have not had as much success on finding the lowest prices on this site, but they do have a great selection. 7. Walmart: I think you would be surprised at what you can find at Walmart. I like Pioneer Woman, so I like the collection they have in the store and I also like finding frames here. They are not as trendy as Target, but they have some good classic furniture and decor items. 8. Your local thrift stores, flea markets and garage sales: This might seem obvious to you, but there are hidden treasures to be found. It is not for the faint of heart though. It is going to take patience and persistence to find those treasures among the junk. Check out www.fleamarketfinder.org to find specific markets near you. 9. Costco and Sam’s Club: These bulk stores may not always have the biggest selection in home decoration, but they do have some might fine deals on furniture. Be alert and when you are ready for those larger purchases, don’t forget to look here. Both of these stores have great online shopping options too. 10. Etsy.com: I love Etsy because it is easy to find custom home decor items for a fair price. I have found some amazing artists on this website, and I have been pleased with my purchases. Search something you are looking for and when you find shops that you like follow them and recommend them to others. Other home decor sites that are solely online and have great reputations are West Elm, Joss and Main, and Wayfair. 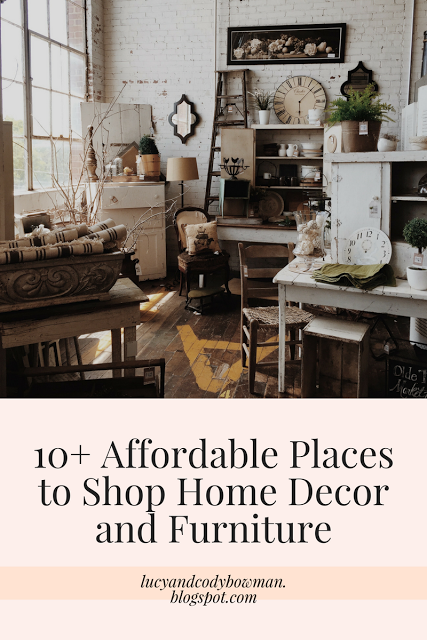 If you want a more comprehensive list of online decor and furniture stores, check out this article. I hope you find just the right things to create something much more important–your heaven on Earth!